HMAS Toowoomba is the seventh of eight Anzac Class Frigates built for the Royal Australian Navy (RAN) by Tenix Defence Systems, Williamstown, Victoria. 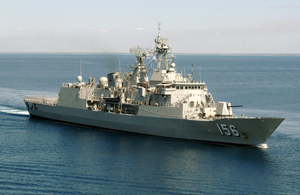 Toowoomba is a long–range frigate capable of air defence, surface and undersea warfare, surveillance, reconnaissance and interdiction with an ability to counter simultaneous threats from aircraft, surface vessels and submarines. Toowoomba is fitted with an advanced package of air and surface surveillance radars, omni-directional hull mounted sonar, a Mine Obstacle Avoidance Sonar and electronic support systems which interface with the state-of-the-art 9LV453 Mk3 combat data system. The ship’s main armament comprises one 5-inch (127 mm) gun capable of firing 20 rounds per minute, Harpoon anti-ship missiles, ship launched torpedoes and a vertical launch system for the Evolved Sea Sparrow anti-air missile. Other ship’s defence systems include the Nulka active missile decoy system, off-board chaff and a torpedo countermeasures system. A CODOG propulsion plant enables the ship to sustain speeds of greater than 27 knots and allows an operational range in excess of 6,000 nautical miles at 18 knots. The ship can embark a multi-role Sikorsky S-70B-2 Seahawk helicopter to enhance anti-submarine, anti-surface warfare and Search and Rescue capabilities. Embarkation of a helicopter also provides the ship with the capability to deliver air-launched torpedoes. HMAS Toowoomba is the second RAN ship to bear the name of Queensland’s inland city. HMAS Toowoomba (I) was one of 60 Bathurst Class Minesweeping Corvettes built in Australia during the Second World War as part of the Commonwealth Government’s wartime shipbuilding program.